Have I told you that I love roses? They are so beautiful and they come in every color imaginable. If I didn’t love card making so much, I would spend a lot more time in my yard. Beautiful plants, especially the flowering ones, are just so joyful! This die cut and stamp set is simply elegant. 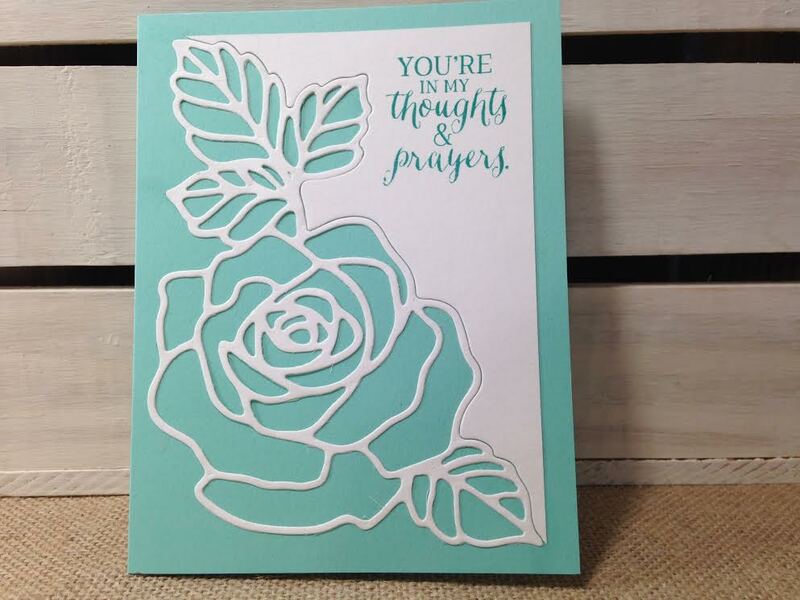 I saw this card over and over again on Pinterest and Splitcoaststampers, so I have no idea who the original creator is. I love it’s simplicity. Pool Party and Whisper White card stock are so pretty together. Stunning card. So quick to put together, one die cut and one or two stamps and it’s done. Thank you for your comment Patti! This card would look good with any of the Stampin’ Up! colors and like you said, it’s quick! I’ve entered your name in the drawing for the free Stamp set! Good luck!